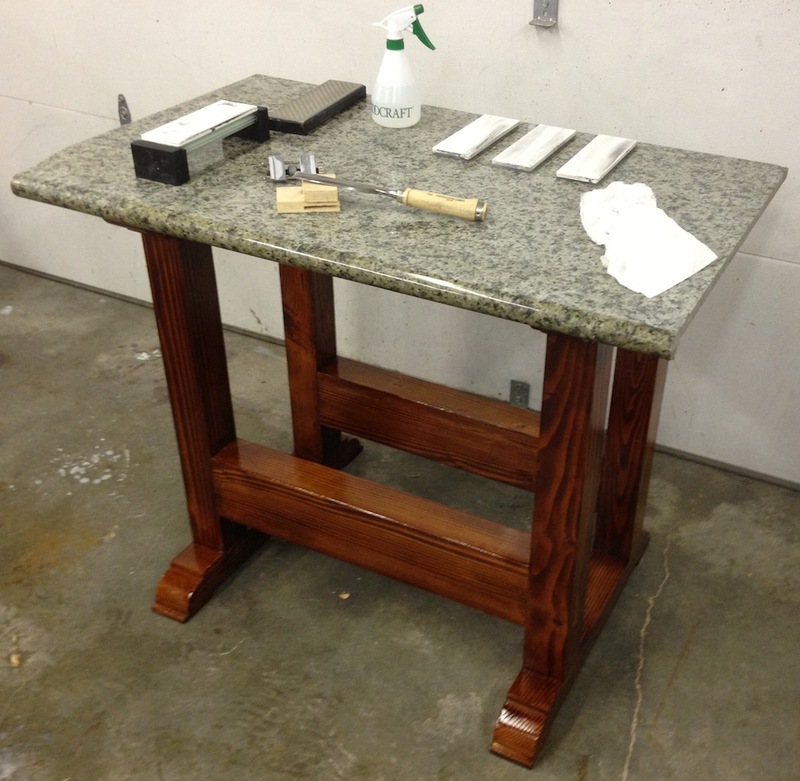 Sharpening Station – In Use! I put the sharpening station into use tonight. Last night I added a coat of “Dark Walnut Danish Oil” to take the pink cast out of the stain. That helped. Tonight I brushed on a coat of orange shellac and called it “good enough”. I still plan to add a drawer, but I need to focus my efforts the next two weeks on making three Christmas presents and don’t have the time to figure out the drawer right now. I had a few extra minutes, and I’ve been dying to try out my new Shapton sharpening stones. For background, in the distant past I used a norton oilstone (freehand), which was pretty marginal (both the results and my skill at sharpening). I used a norton 1000/8000 waterstone, which was better but it made a terrible mess. And it dished out really fast. Then I used 3M sharpening film, which produced a good edge for me, but ultimately I wasn’t happy with it. I tried DMT diamond stoned, and they cut OK, but the 8,000 grit diamond stone was completely useless. I could never get a polished edge with it. I’ve read a lot of good stuff about the Shapton stones, and based on my initial experience with them I’m really pleased. 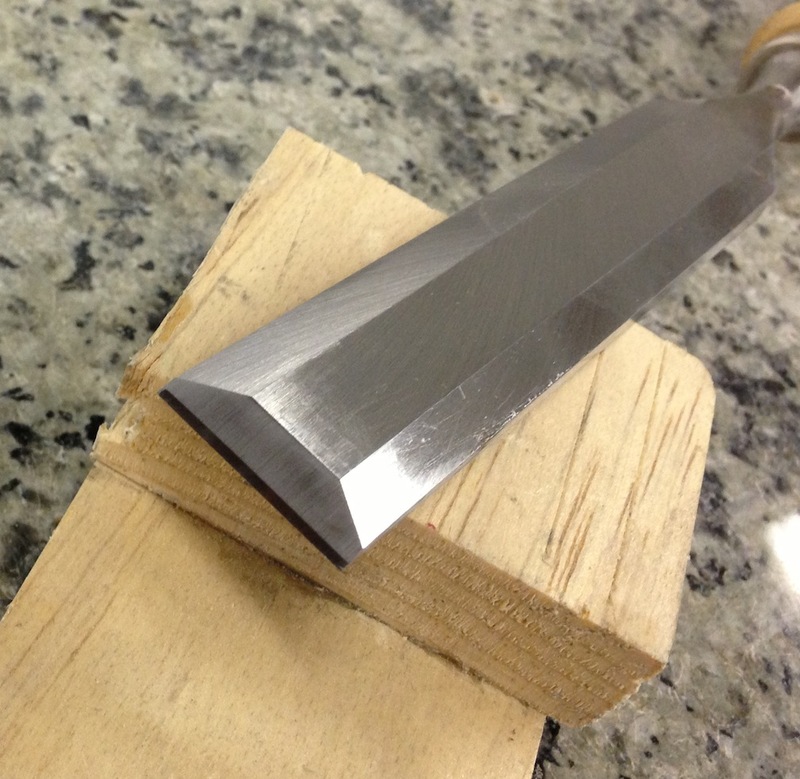 I sharpened the 1″ chisel I was using recently. It had a “micro bevel” that had grown to about 1/3 of the bevel area, and had several nicks. Normally I would have started on the 220 DMT stone to “grind” it back into shape. It took about 40 strokes on the 1,000 grit Shapton to re-shape the bevel. It would have taken about the same effort, or perhaps more, on the DMT. Then I raised the angle in my $9 jig and did about 10 passes each on the 4,000, 8,000 and 16,000, then about 10 passes on the back on the 16,000 to remove the burr. I probably need to spend some time improving the flatness of the back, but it’s pretty darn close to flat. Just a tiny spot on one corner of the back where the polish doesn’t reach all the way to the edge. I’m happy. I’m going out to meet the family for dinner to celebrate. 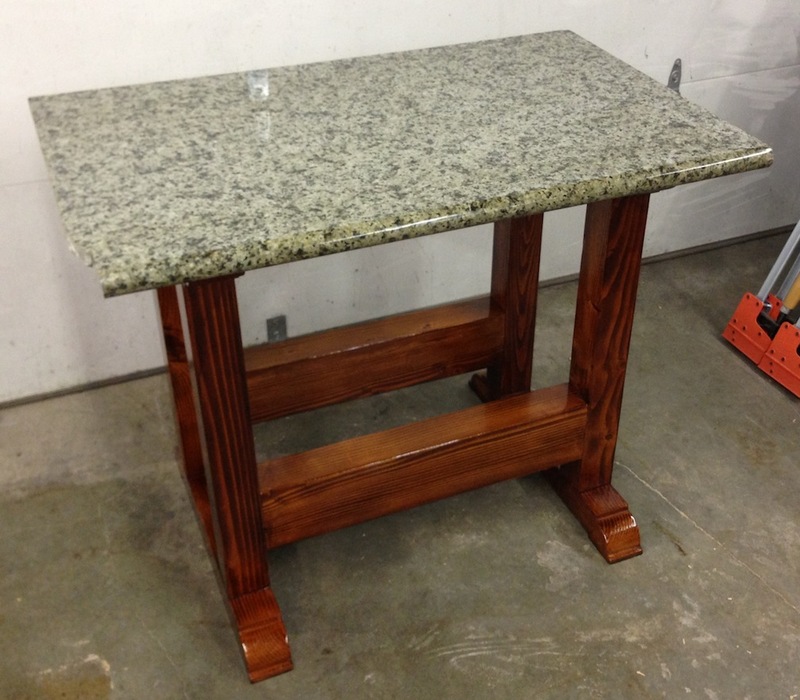 Congrats on finishing the bench, and job well done. Thanks Badger! It won’t be 100% until I can make the drawer, but at least it’s functional now. I feel really good about my sharpening setup now. On to Christmas gifts! Yippeee! That a well made and study station. Jealous here!